Travellers on the Arriva Train Wales Aberystwyth to Birmingham line may catch a glimpse of a very rare sight indeed as they approach the Dyfi Junction stop. On a lofty platform a stone’s throw from the railway line, an osprey (Pandion haliaetus) nest has been erected after several sightings in the area. Since 2008 the nest has had ospreys in residence. In 2001, the first osprey eggs in centuries were laid on the Dyfi. Breeding has continued yearly since then, as documented by the Dyfi Osprey Project. Ospreys spend the winter in Africa, and migrate back to Europe in March and April to breed, often returning to the same sites, sometimes for decades. Females lay a clutch of 2-3 eggs from mid-April to mid-May, which are incubated until they hatch, around 45-50 days later, by both her and her mate. Chicks fledge at around 53 days, and mature slowly, only breeding when they reach around four-five years. This, and the low numbers of breeding pairs, mean that the osprey is now a rare sight in the British Isles. Records are unclear as to when ospreys disappeared from Wales, but what is certain is that the 19th century saw a dramatic decline of the raptor. The birds were persecuted, highly valued by egg and skin collectors, and while Victorian aristocrats were busy filling up their display cases and private collections with eggs and taxidermy, they were emptying the skies of these spectacular birds. Records do show that Wales shares a long history with the osprey. The Swansea and West Glamorgan coats of arms both depict this majestic bird. In the Mabinogion, the Eagle of Gwernabwy aids Culhwch in a quest by taking him and his men to see to the Salmon of Llyn Llw. Although it is unclear which species this mythical bird is, his affinity with salmon perhaps suggests an osprey, a gwalch y pysgod (fish-hawk) as they are known in Welsh. Their diet earned them this name, of which 99% is made up of fish, occasionally supplemented by rodents, rabbits, hares, amphibians, other birds, and small reptiles. Their fishing technique is both distinctive and dramatic, as they soar down to the water, wings swept back, stretching out their talons at the final second to pluck some unlucky wallowing fish from the shallows, sometimes becoming completely submerged for a few seconds. For hunting convenience, ospreys rarely nest more than 5km away from a body of water. Their bodies are well adapted to their piscivorous lifestyle, with short sharp spines covering the base of the foot-pad, coupled with long sharp talons and backward facing barbs on their toes, making their feet a deadly weapon. They have reversible toes, a rare characteristic they share only with the owl. Their closable nostrils and dense, oily coats allow them to be submerged in water, although they are unable to penetrate the surface any deeper than around 1 metre. Ospreys are distinctive for their pure white breasts and underbellies. Their heads are also white, with a brown mask across amber eyes, and their white feet are decorated with black talons. They have black bills with a waxy blue base, or ‘cere’. Their wings are brown and an osprey is easily spotted when in flight, as four long protruding feathers, and a fifth shorter one, are reminiscent of human hands. 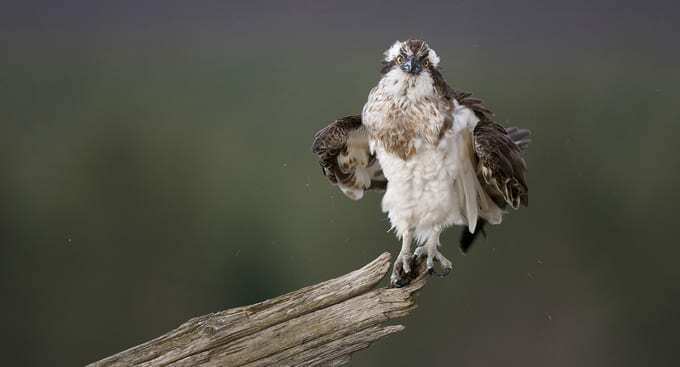 Ospreys have already proved they are tenacious enough to return to Wales uninvited, unaided, with no human intervention. With wild habitats restored to west Wales, we can hope to see these birds gracing our blue spring skies in much larger numbers.